The Ritual was one of those movies that I’d seen the trailer for in the cinema but didn’t get the chance to catch the release on the big screen, now that the Movie is out on Digital Download and coming to DVD on the 12th February, it was time to watch the movie in the comfort of my own home. 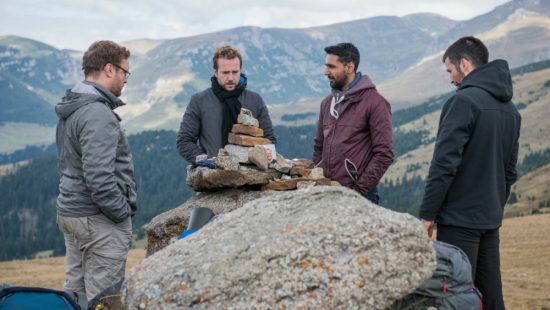 After the traumatic death of their close friend Robert, a group of University mates set off on a hiking trip to Sweden to reconnect and pay tribute to their lost friend. After one of the group falls and becomes injured, they decide to take a different route through an ancient, pathless Forest to shorten their trip. However, something is lurking in the forest and soon they are being stalked, but by what? Based on the terrifying novel by Adam Nevill. With the group lost in unfamiliar surroundings and down to limited supplies, things start to happen which are not only unsettling but also freaky, to say the least, as they move deeper into the forest there are signs of something scary and sinister going on, such as a gutted animal in the trees, strange carvings on tree bark and the and an impending sense of panic starts to creep in among the group. Strange noises in the forest make them feel that someone or something is stalking them through the forest. Hungry, injured and fearing for their lives, they find a wooden structure to hide in it from the rain and fear that is out there, but there is something out there and they are yet to discover what or who it is. The Ritual is a nicely shot British horror that has all the hallmarks of a movie that will have you on the edge of your seat and to make it worse for you a lot of the film is shot in the dark and most of the time everything is lit by torchlight, so you have to watch the movie with the lights off to see everything. If like me you watch movies in DD 5.1 the atmosphere is heightened by the use of the rear speakers throwing out those creepy effects to just set your nerves on edge a little more, always good for a movie of this genre to play on all the audio senses. The use of the lighting effects throughout the film work well, such as the lightning lighting up those glimpses of things in the shadows, that includes the rather strange wicker man in the cabin, also look out for the rather bizarre dream sequence at around 28 minutes into the film which leads to a “WTF” moment, if I had a dream like that I’d absolutely brick it. The Ritual is certainly one of those psychological horrors that will have you wondering whats coming next an what the hell is happening, who or what is doing this to the group and you’ll also think twice about hicking out in a forest and entering a strange cabin, but then again we all know the rule, don’t go into the cabin in the woods! Continuing through the film we have the terrifying moments of Luke’s (Rafe Spall) gilt manifesting before moments of the group being attack by something that will make the hairs on the back of your neck, think of those moments in Blair Witch when there was something there, you couldn’t see it, but you knew it was there watching in the darkness! 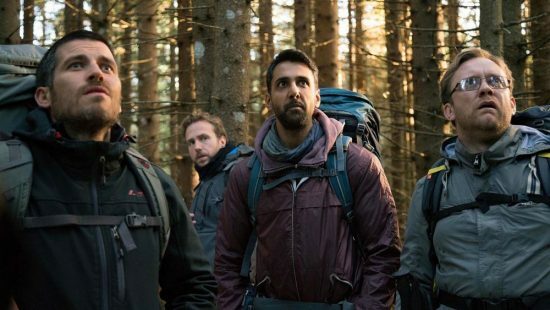 The Ritual certainly plays out your fears and with such a superb cast, Rafe Spall (Life of Pi, The Big Short), Robert James-Collier (Downton Abbey), Arsher Ali (Four Lions, Line of Duty) and Sam Troughton (Robin Hood, Vera Drake), director David Bruckner (The Signal, Southbound) has brought us a movie that is not only terrifying in its concept, but also in its use of visuals, sound and uncanny psychological effect on you while you watch The Ritual. The Ritual is one of the best horrors that I’ve seen this year, it is a movie that really plays on your mind and senses to shock you, the movie is available on Digital Download now and DVD from 12th February 2018. The DVD also features interviews with the cast and crew including the director, producer and executive producer.